Home / My Rutland Life / Recycling in Rutland! Today I’ve been recycling. It has not involved Rutland recycling’s colour-coded three-bin system and alternate week collections… No, it’s more like skip diving. An overgrown field beside the bridle path has undergone a transformation. Ignored for many years, nature had taken it over: half an acre of brambles ringed by ash trees (oh dear) … impenetrable except by rabbits. Suddenly, the farmer has decided to put it back into use, and sent in the diggers, pulled out tree stumps, towed away an old caravan, cut back brambles and had several massive bonfires. 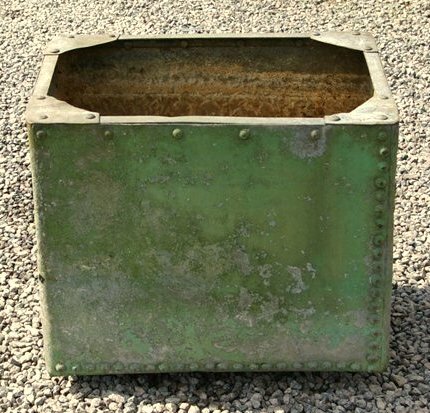 I noticed a distressed galvanised steel water tank, grubbed up by the digger and lying on its side… I started to wonder. And I noticed it again two weeks later, alone and unloved, now surrounded by hawthorn trimmings left by the craftsman re-laying the hedge. So I got on the phone to the farmer and he agreed that the tank would be far better recycled as a planter than chucked in a skip. So this morning, a friend with an estate car offered to help me bring it home, but neither of us realised quite how muddy the field would be, not only due to the 12 inches of rain we’ve had in the last week, but because the heavy machinery has churned it into a quagmire. We squelched and slipped to the tank, heaved it out of its hawthorn nest and half-dragged, half-slid it to the side of the road: not heavy, but awkward – and not helped by a fit of the giggles. We managed to hoick it into the back of the car and get it home before anyone asked us what we thought we were doing. It is now in position at the corner of the cottage, in a ‘dead’ spot that needed cheering up. It’s already beautifully weathered and has just the right greeny-grey patina. When I’ve found something (somebody?) to punch drainage holes into the base, it will be planted with tulips: a combination of Queen of the Night, Groening and Recreado. And that’s recycling in Rutland.